ROURKELA: Normal life in Sundargarh town was disrupted when government offices reported thin attendance and business establishments downed their shutters today in solidarity with the agitating students of Sundargarh Government College. The students have been demanding appointment to the vacant faculty posts. Backed by the Congress’ student wing, the National Students’ Union of India (NSUI), the bandh with tacit support from various political outfits and organisations including the local bar association evoked spontaneous response from commercial establishments, banks and educational institutions. The picketing parties of the students also effected closure of state government offices. The beleaguered students of the college joined hands with NSUI, as academic performance of the college over the years touched a new low due to lack of lecturers. Stung by the stir, the Sundargarh district administration assured the agitators to take up the matter with the government for urgent action. However, the Sundargarh unit NSUI president Ajay Amat threatened to lock the college if the government persists with its dilly-dallying attitude. Meanwhile, the indefinite hunger strike launched by five students, Hemanta Padhi, BR Panda, Umesh Sharma, Amit Roshan Lakra and Sashikant Purohit, in front of the college, entered second day today. Sources said of the total 51 sanctioned posts, 32 lecturers’ posts including that of the principal are lying vacant. The botany department is being run by a single lecturer, while the approved staff strength is five. Similarly, for chemistry there is only one lecturer, while five posts are lying vacant. The situation is the same for most departments of the college, sources added. The the demand for Separate Kosal state has been intensified in the western part of Orissa with the wake of separate Telengana demand. 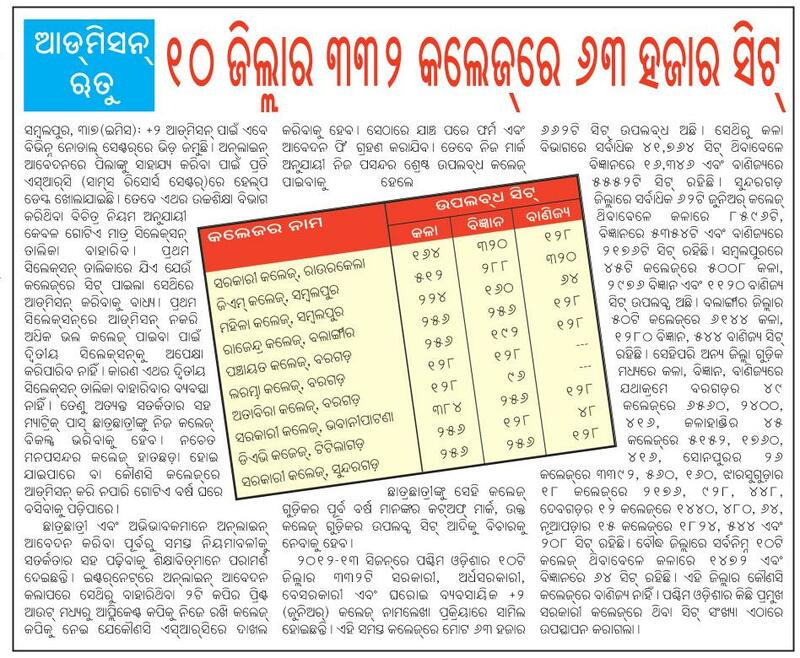 While Kosal Kranti Dal, the political outfit of Kosali Ekta Manch has given Kosal Chaad abhiyan, the mother organisation Kosali Ekta Manch has left no turn unturned. By organising seminar and conferences in several part of the country and the world to involve the intellectual mass in the movement the manch is now in a now or never move. We have been treated as Second grade citizen and this stepmotherly attitude will not be tolerated any more said Promod Mishra, the president of Kosal Kranti Dal at Balangir last night. Palpable agitation is mountig at Rajendra College(Autonomous), Balangir, G.M College, Sambalpur and Govt, College Rourkela for formation of Kosal state. The region which has experienced a havoc by the student in current month will face another carnage if the plan of student executed. The President of Sambalpur University , Padmanava Mishra is planning to sit for a till death hunger side in few days. Argument and counter argumnet between students, teachers and and oter staff is going on for a formation of kosal state. The teachers of Sambalpur University are ardently supporting the demand for it will give a face lift to the only university of Kosalanchal. The All Kosal Students Union is going to call Band on last week of december followed by economic blockade. The Kosal Kranti Dal is going to gherao the governer house in 23rd of december and thiier the laymen of western orissa will seat in mass hunger strike till the state is declared said Baidyanath Mishra the Mahasachib of Kosal Kranti Dal.